Upgrade from a personal use pump for faster, quieter & more effective pumping sessions. Rentals are available through our Greater Boston location in Newton, Massachusetts Monday through Friday 9 a.m. – 4:30 p.m., and Tuesday 9 a.m. – 7 p.m. We will set up the kit you choose and discuss handling and storage of your breast milk. We assist with practical advice concerning breastfeeding as well as balancing home and work needs. Continued telephone support is included with your rental. Please contact us at sales@lactationcare.com. 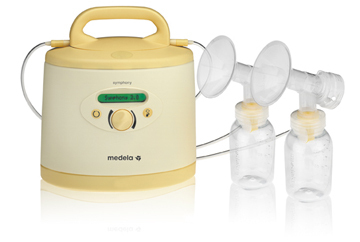 Symphony is Medela’s latest innovation in hospital-grade electric double pumps and is available for moms to rent from our office in Newton. The Symphony is ideal for moms who have a medical need or who want to use the same pump used in hospitals. Featuring the original 2-Phase Expression® technology – found only in Medela breastpumps. With this technology, the Symphony is proven to reduce pumping time through faster let-down and milk flow and to remove as much milk as a breastfeeding baby. Weighing in at just over 7 lbs., the Symphony will pump both breasts simultaneously in 10 minutes. For busy moms returning to work or school, the Symphony is a fantastic option. Each mother needs her own kit which attaches to the Symphony Breastpump. This kit can be used to single pump or double pump both breasts on the Symphony. Replacement parts are available a la carte. Cleaning Deposit: A refundable cleaning deposit of $20 will be assessed at time of initial rental. Need the pump longer? Just call us and we can extend your rental over the phone: 617-244-5593. Rental fees will be prorated and reimbursed. There is no minimum rental time. Rent for as long as you need. Return the pump when no longer useful to you.